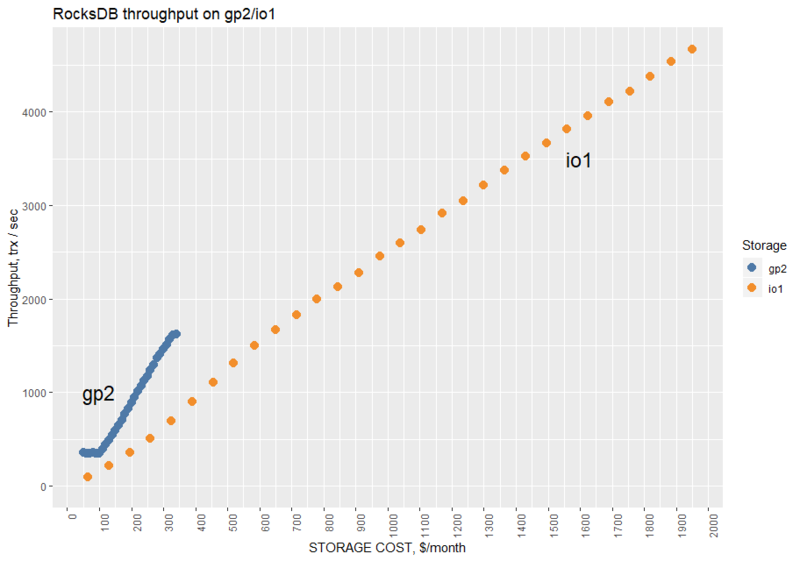 So for the first result, let’s see how InnoDB scales with increasing IOPS. There are a few interesting observations here: InnoDB scales linearly with additional IOPS, but it faces a throughput limit that Amazon applies to volumes. So besides considering IOPS, we should take into account the maximal throughout of volumes. 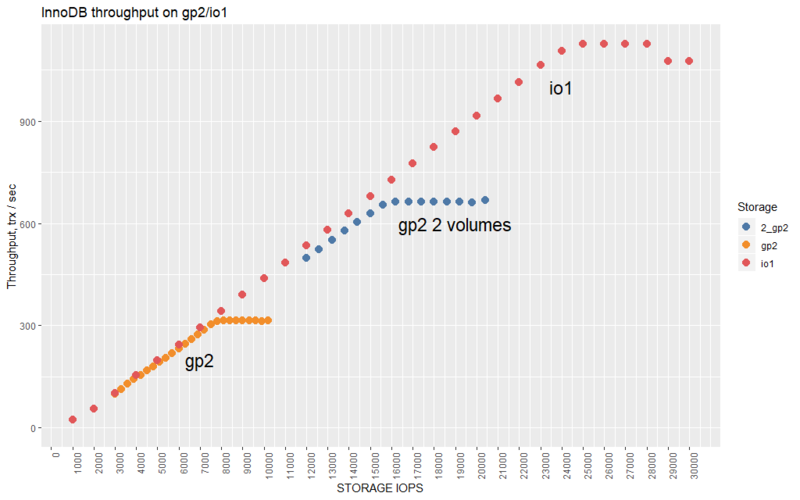 It’s interesting to see here the slope for gp2 volumes is steeper than for io1 volumes. 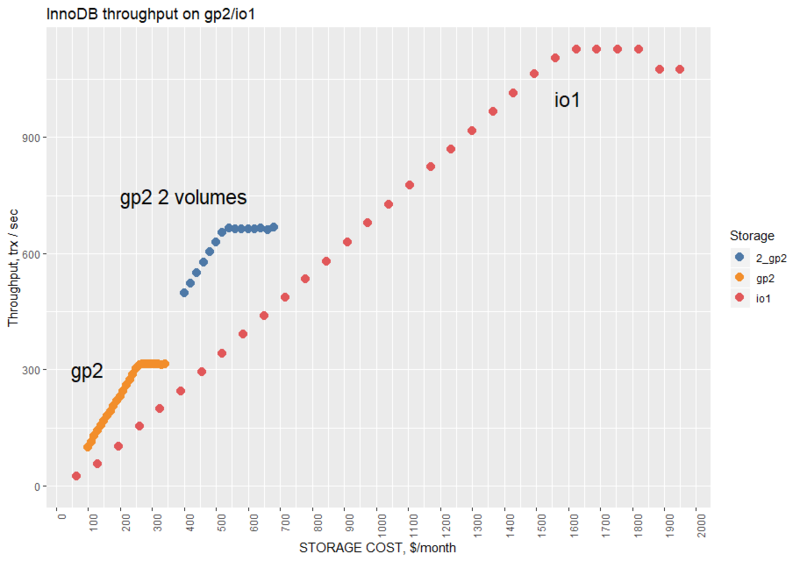 This means we can get a bigger increase in InnoDB performance per dollar using gp2 volumes, but only until we reach the IOPS and throughput limits that are applied to gp2 volumes. Here we can also see that MyRocks scales linearly, showing identical results on gp2 and io1 volumes. This means that running on gp2 will be cheaper. Also, there is no plateau in throughput, as we saw for InnoDB, which means that MyRocks uses less IO throughput. 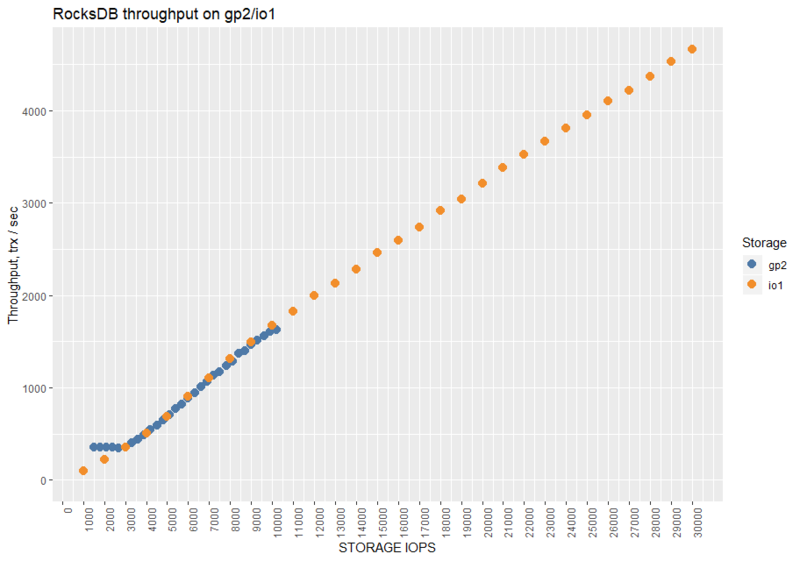 Both MyRocks and InnoDB can scale (linearly) with additional IOPS on gp2 and io1 Amazon volumes. Take into account that IOPS is not the only factor to consider. There is also throughput limit, which affects InnoDB results, so for further scaling you might need to use multiple volumes. Which instance type did you use? Something that can be confusing is that Amazon quotes EBS throughput for instance types (in mbit/s) and throughput for the different disk types (in mb/s). My pitch for MyRocks has been better write endurance and less space used — which are important with SSD. The better write efficiency also boosts throughput with disks, but that is less important for OLTP. Thanks for making clear that better write efficiency also boost throughput with cloud storage.